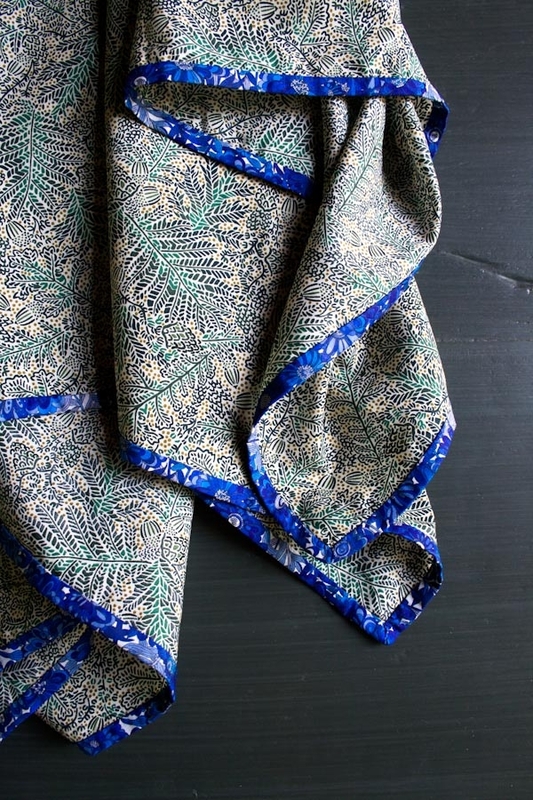 One of the most common questions we hear when customers are poring over our collection of Liberty of London’s Tana Lawn is, “Is this silk?” With its impeccable weave and incredibly soft and smooth feel, it’s hard to believe that this lovely fabric is 100% cotton, but it is! 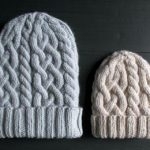 To make one scarf you will need . 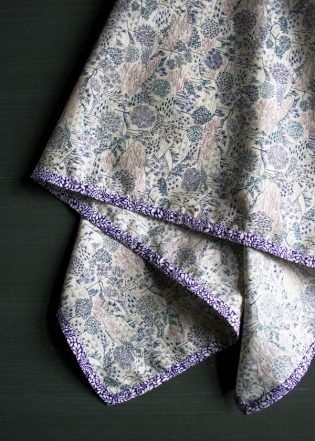 . .
For the main fabric: 1 yard of Liberty of London’s Tana Lawn Classic or Seasonal. 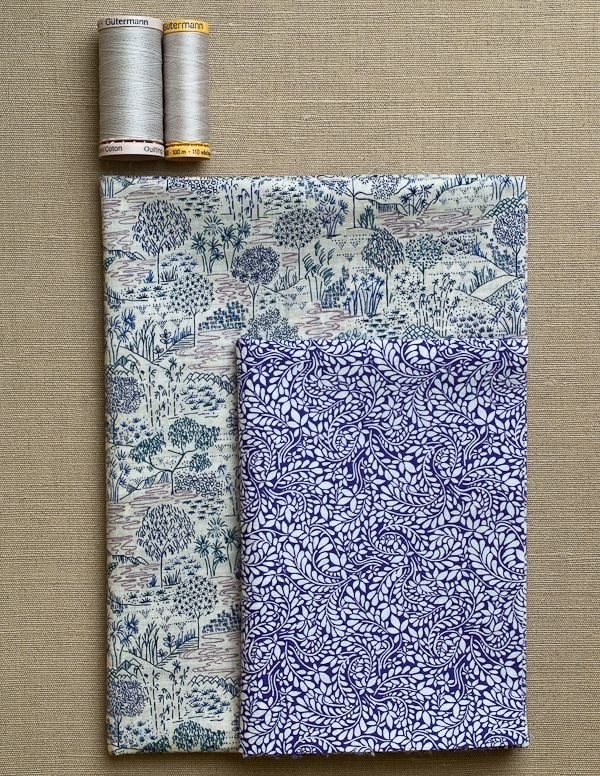 For the binding: ¼ yard of Liberty of London’s Tana Lawn Classic or Seasonal in a complementary print. A small spool of Gutermann’s Cotton Thread in a coordinating color. 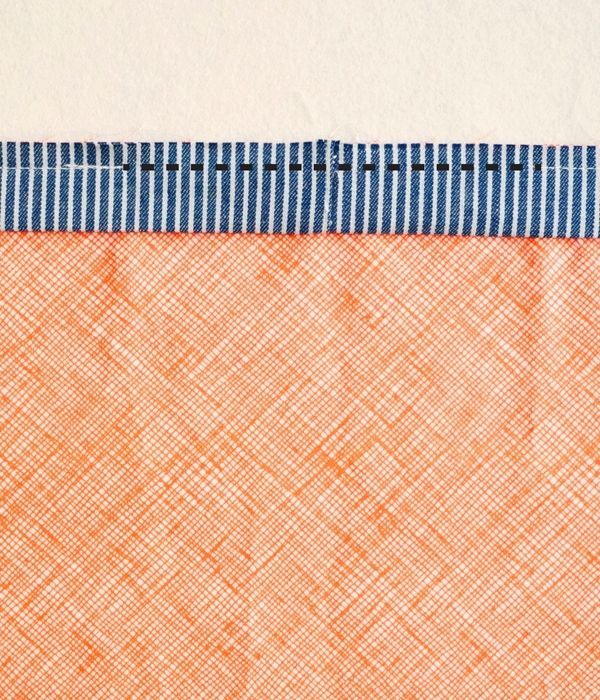 Gutermann’s Hand Quilting Thread in a coordinating color. Prewash and dry all fabrics before starting. 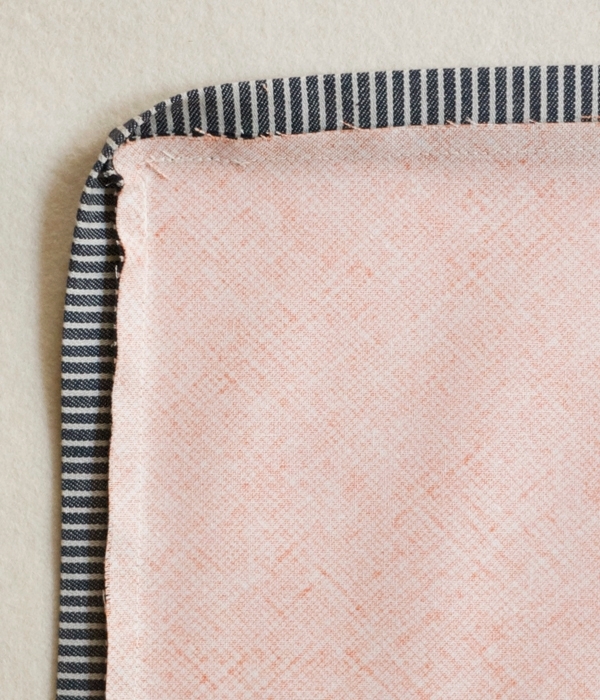 For the sake of clarity our instructional photos show fabrics with a clear right and wrong side. Note: The best way to make straight, clean cuts is with a rotary cutter and a non-slip quilting ruler on a self-healing cutting mat. If you have limited experience using a rotary cutter, I recommend visiting our Rotary Cutting Tutorial. Cut the scarf panel into a 36-inch square. 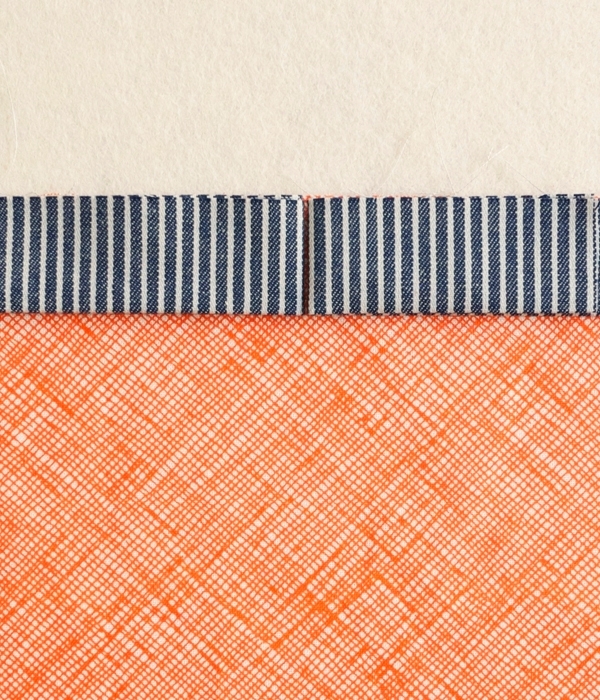 Cut three 2-inch strips from selvage to selvage from the binding fabric and then cut off the selvages. You will have three 2-inch by (roughly) 52-inch strips. 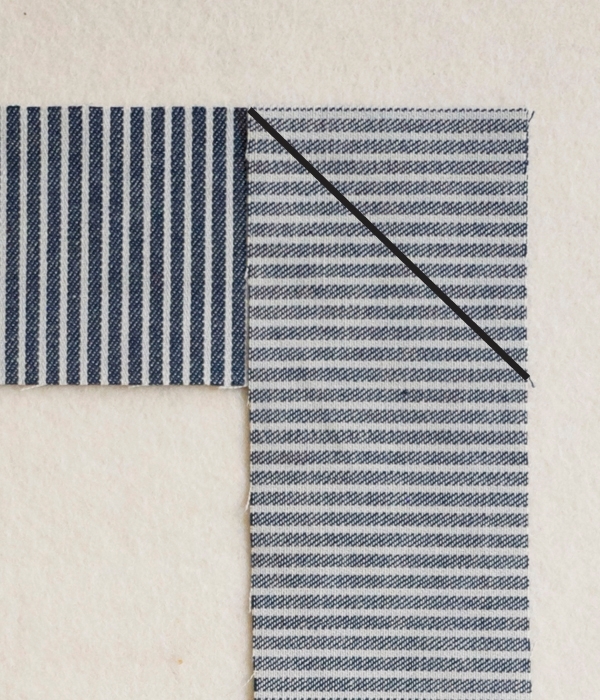 With their right sides facing each other, stack the ends of two binding strips so that they form a 90-degree angle and there is a square shape where they overlap. Pin in place. 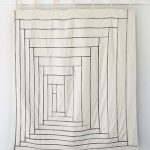 Using your preferred fabric marking tool (or a pencil), draw a diagonal line from the top left corner of this square to the bottom right corner, as shown above. 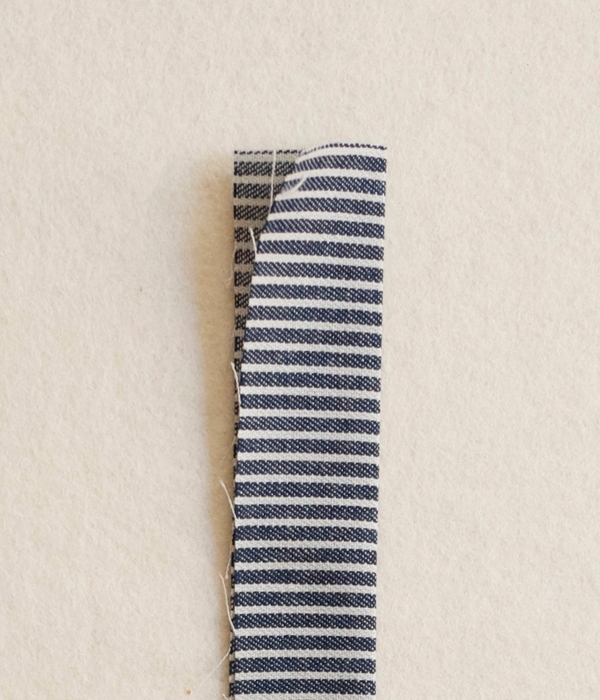 Sew the strips together along this marked line. 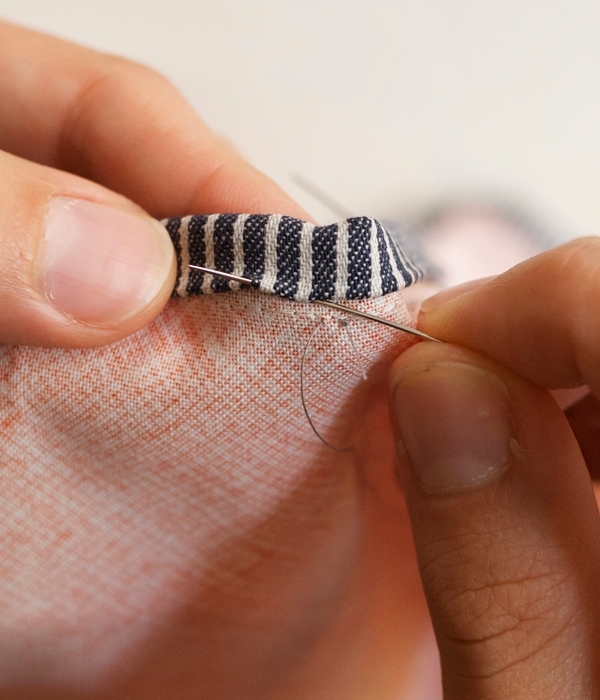 Trim the seam allowance to ¼ inch and press the seam to one side. Repeat these steps to attach the third binding strip to the end of this strip. 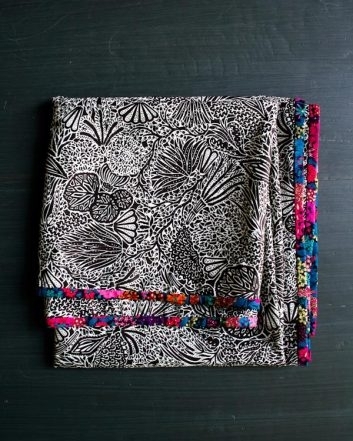 Place the scarf panel with its right side facing up. 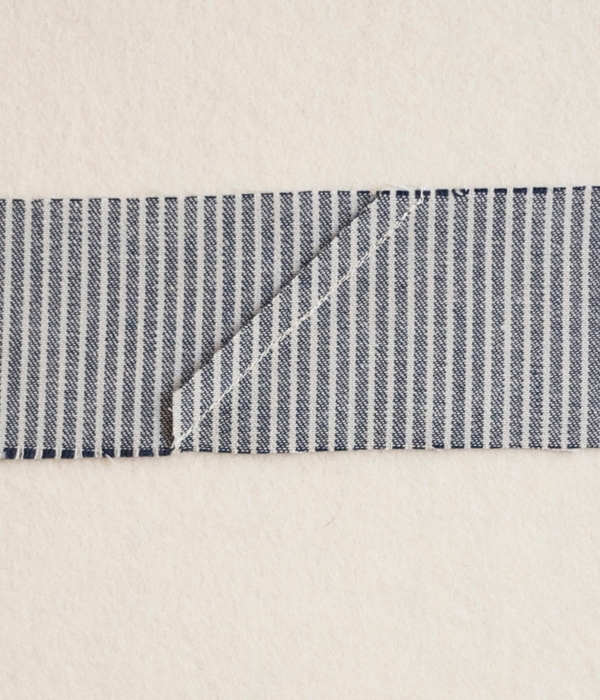 Starting along one of the straight sides of the scarf panel (not in a corner), line up the raw edges of the binding strip with the raw edge of the scarf panel and pin in place. Leave a 3-inch tail at the beginning of the binding strip. 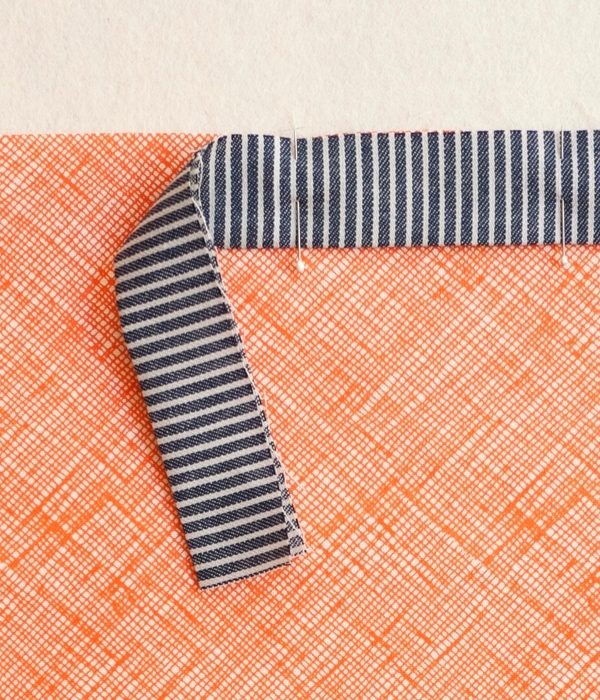 When you get to a corner, fold the binding strip away from the scarf panel at a 90-degree angle. Then double back to start pinning along the next side. As you do, a peaked triangle will naturally form in the corner, as shown above. Later, when you work the Finish the Binding section, this triangle will naturally fall into place as a mitered corner. 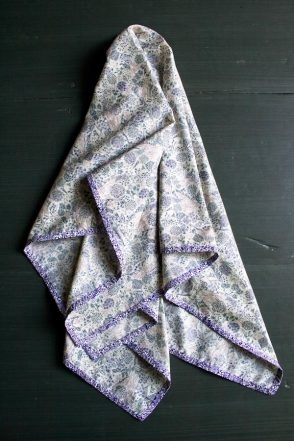 Pin the binding around all four sides of the scarf in this manner, stopping 3 inches before the first pin. There should remain a 3-inch un-pinned gap, as shown above. 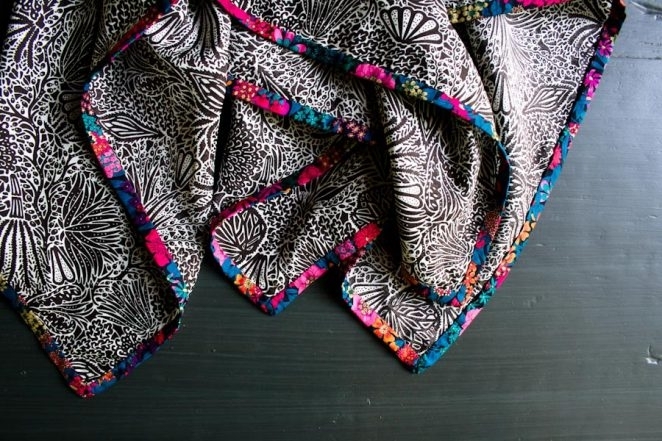 Using the Cotton Thread and starting at the first pin (leaving the 3-inch tail), sew the binding to the scarf with a ¼-inch seam allowance. 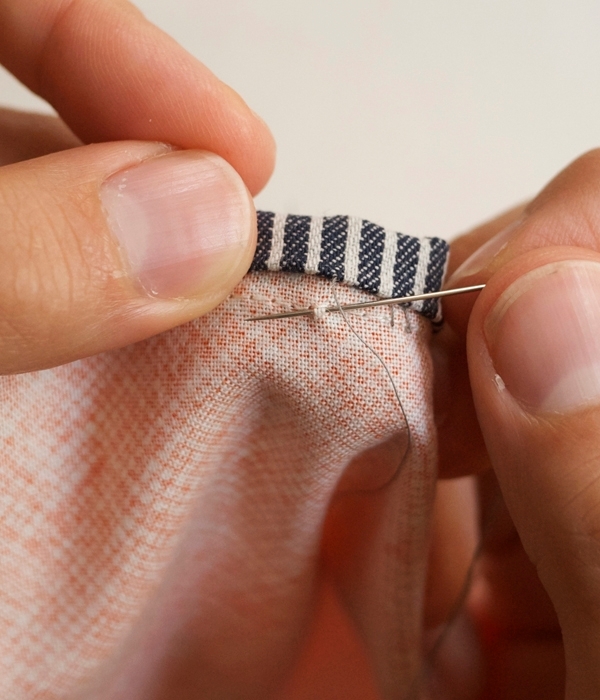 Stop sewing ¼ inch before each corner. Now lay the 3-inch tails down along the gap’s edge. 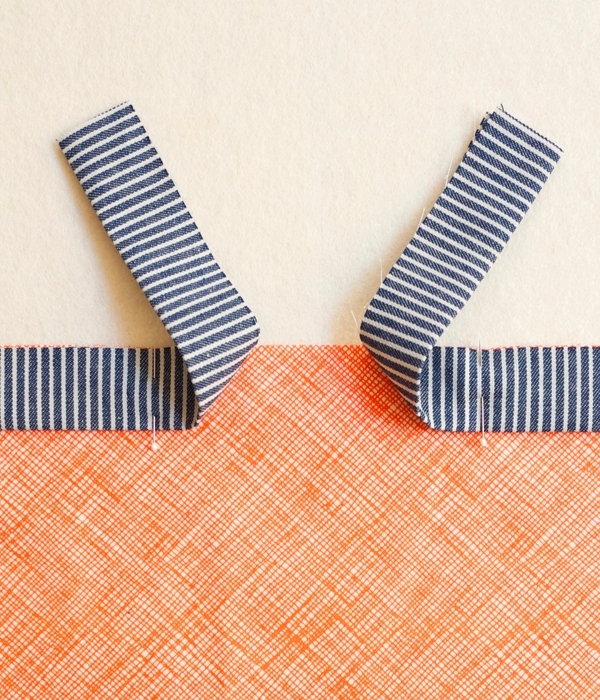 Fold the extra length of both ends where they meet in the middle of the gap and press flat. 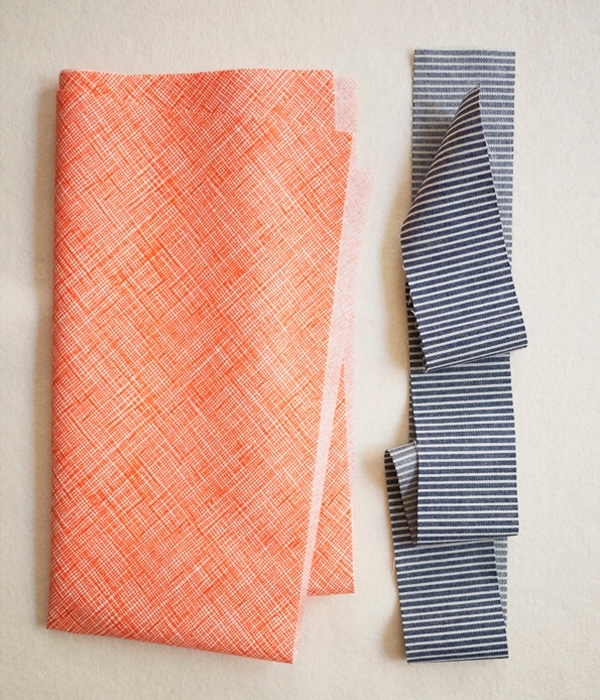 Pull the binding strips away from the scarf panel and open up the tails’ folds. Match up the pressed creases on the two tails, right sides together, and pin them together. Refold the binding and line up its raw edges to the raw edges of the scarf panel. 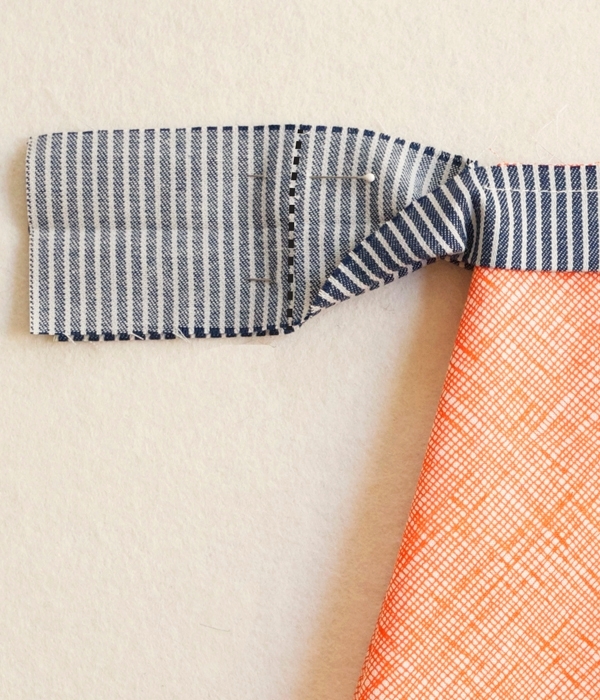 Sew along the gap with a ¼-inch seam allowance. Flip the scarf over so the wrong side is now facing up. Press the edge seams out towards the binding on all four sides of the scarf. 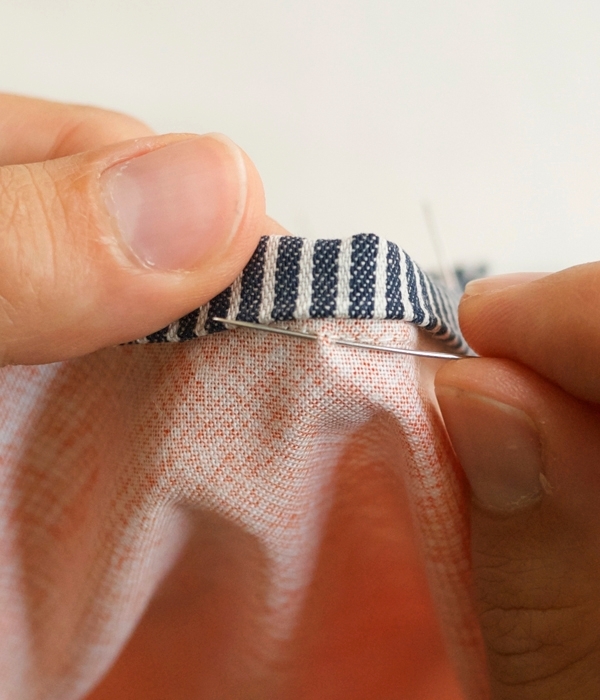 Fold the binding tape around to the wrong side and pin it so that it just covers the seam. 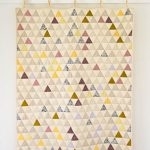 When you reach the corners, fold the triangle of fabric around the fabric and miter them. Fold the binding to form a neat, mitered corner, which should fall easily into place. 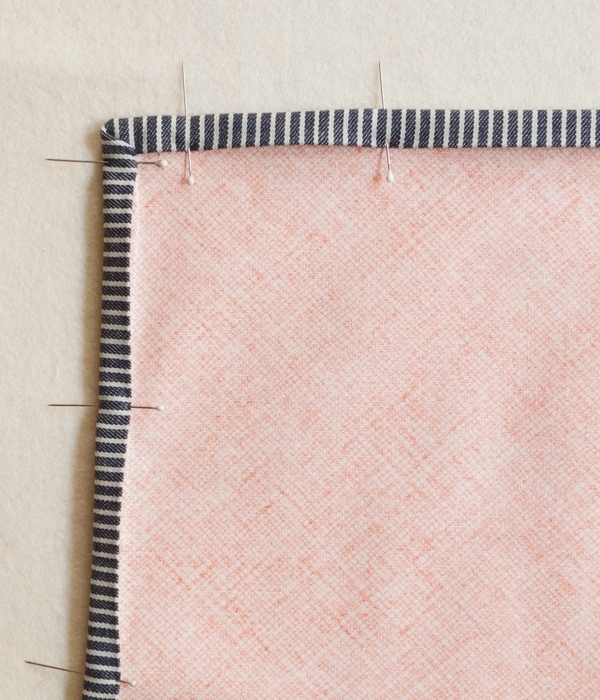 With the back side of the scarf panel facing you, pick up a tiny horizontal stitch from the scarf panel, just under the folded-over binding. 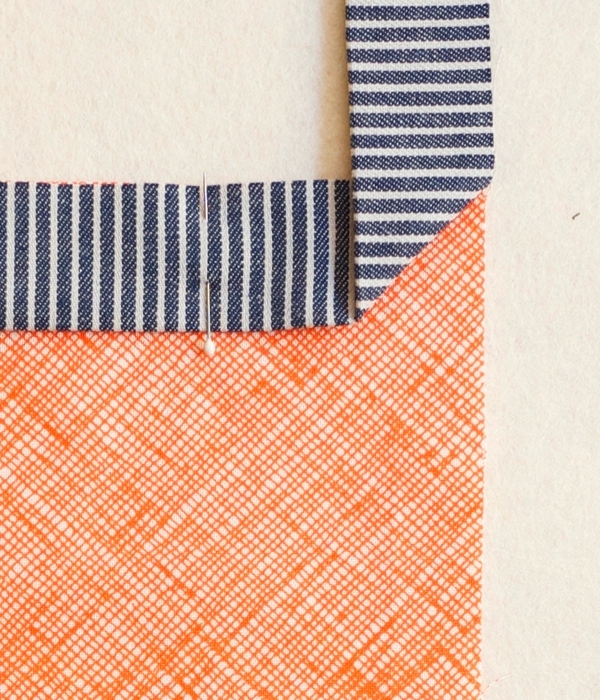 Then, insert the needle into the fold of the binding directly above the spot where the needle exited the scarf panel. 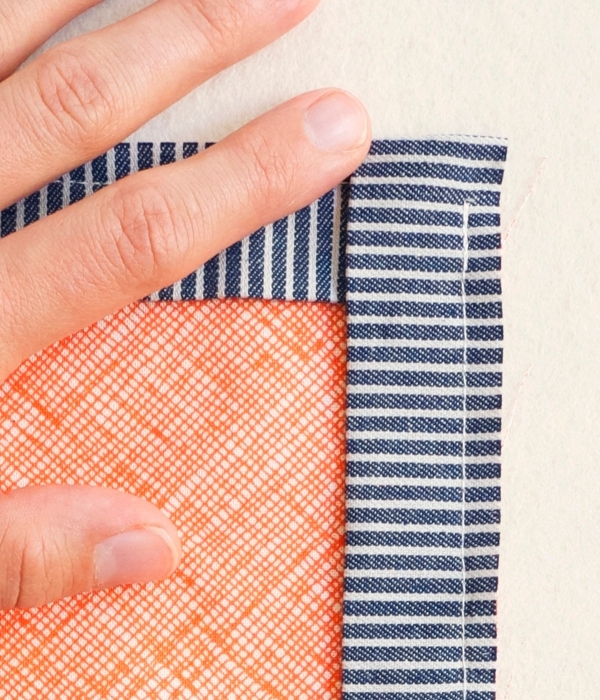 Slip the needle through the fold and come out ¼ inch to the left. Next take a tiny stitch from the scarf panel directly below the spot where the needle exited the binding. 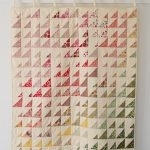 Will you have the Heidi Brown and/or Green Elisa in stock soon? 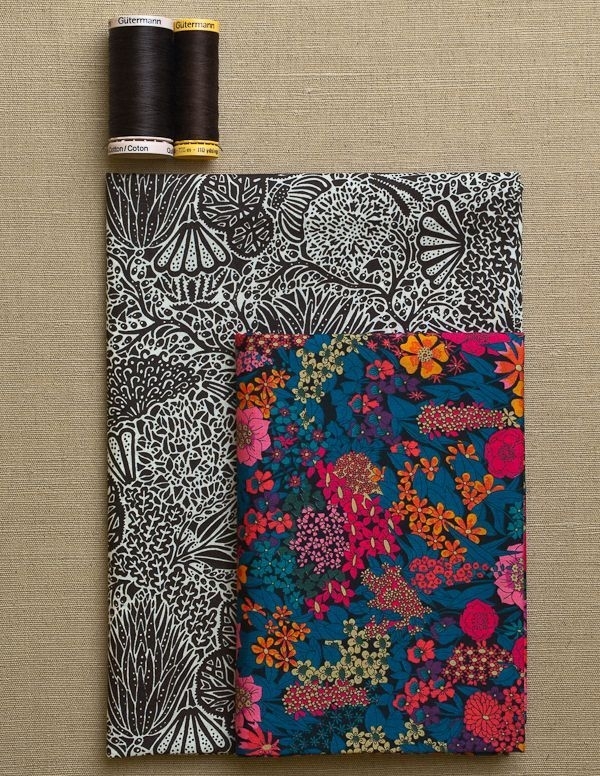 The fabrics you show here are beautiful but I can’t find any of the main fabrics and would love to use one of those. Please email customerservice AT purlsoho DOT com and they will be happy to let you know when we are expecting more of these fabrics. 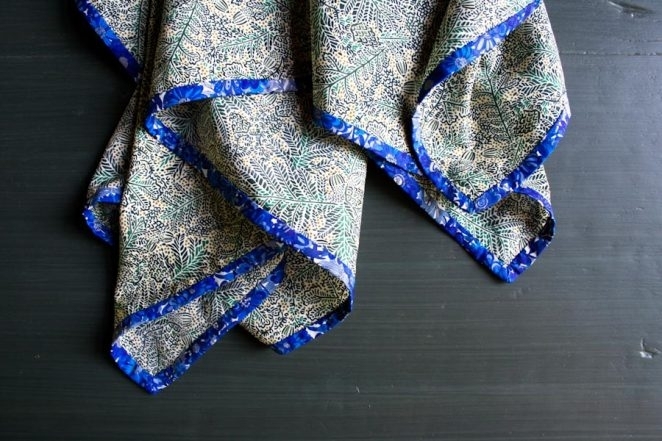 The scarves pictured at the top are double sided. Shouldn’t the tutorial show this? 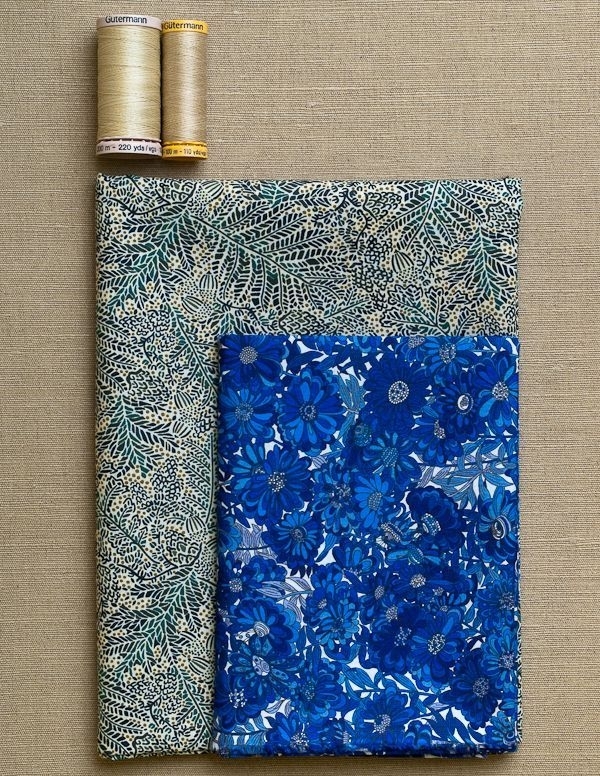 It is no more difficult to start with two 36-inch squares instead of one, put them back to back, and then add the binding. And the finished scarf will be much nicer. 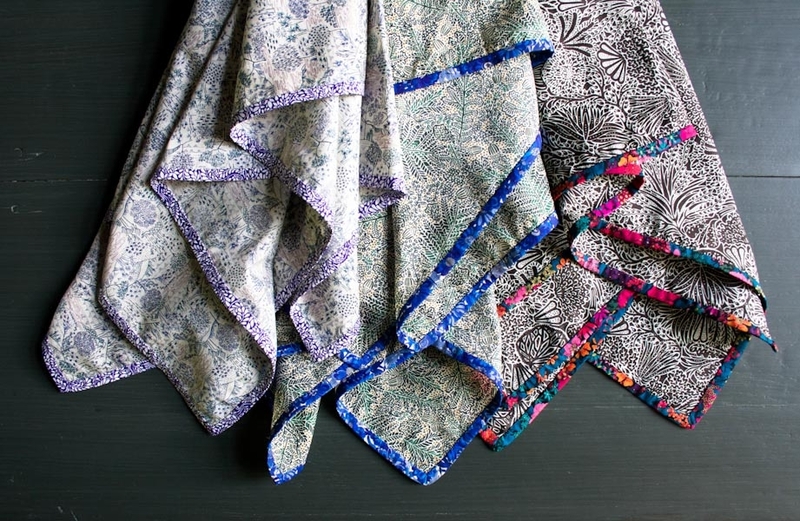 The scarves pictured at the top and demonstrated in the pattern are not double sided, however Liberty of London Tana Lawn is so saturated that the wrong side can be difficult to distinguish from the right side! 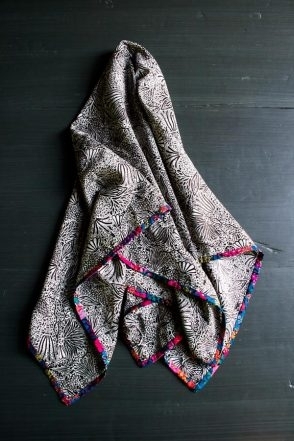 We do have some double sided Liberty scarves which you can see here: https://www.purlsoho.com/create/2011/04/28/mollys-sketchbook-mothers-day-liberty-scarves/ However, making something like this double sided changes the drape and adds a lot of extra weight so personally I usually prefer a single plied Liberty scarf like the one featured here. Thank you for the tutorial. 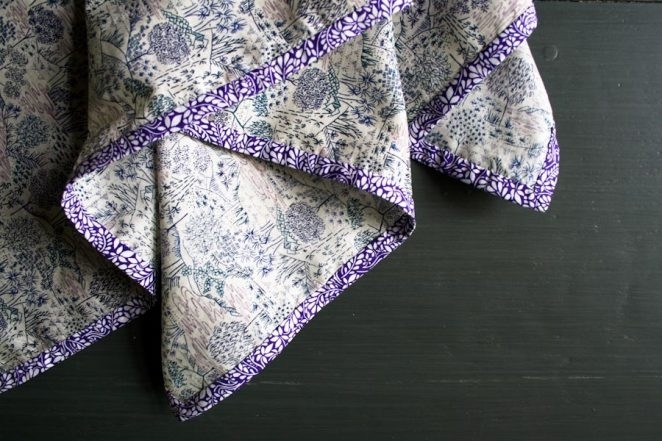 Love the Liberty fabric and the thought of it against my neck…. ahhhhhh! I just finished making two scarves with this method as Christmas gifts for my mom and mother-in-law. I used 1/2 yard cuts instead of the full yard for a smaller scarf. They turned out perfect! Thanks for this project! 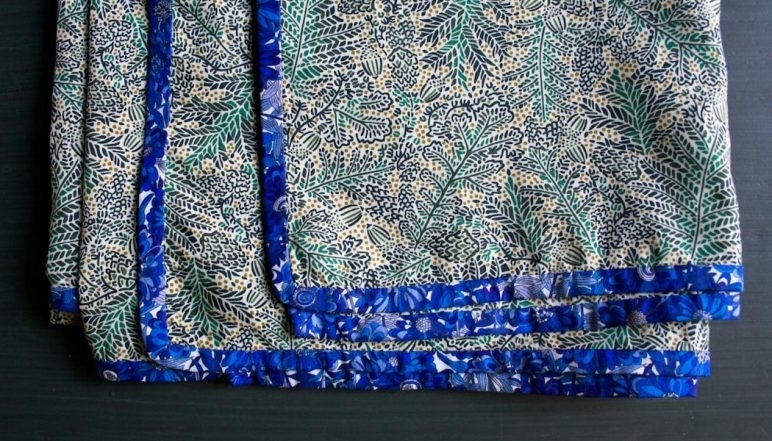 The drape is definitely better with only one layer of fabric and it doesn’t seem to matter that there is a “right” side to tana lawn. your tutorials are wonderful. They have helped me tremendously especially with the binding. I made two of these- one for myself and one for a friend. They came out great! 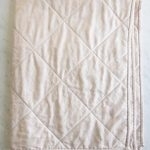 I actually think they make a great gift for a new mama- I use mine all the time as a makeshift baby blanket/nursing cover/etc. 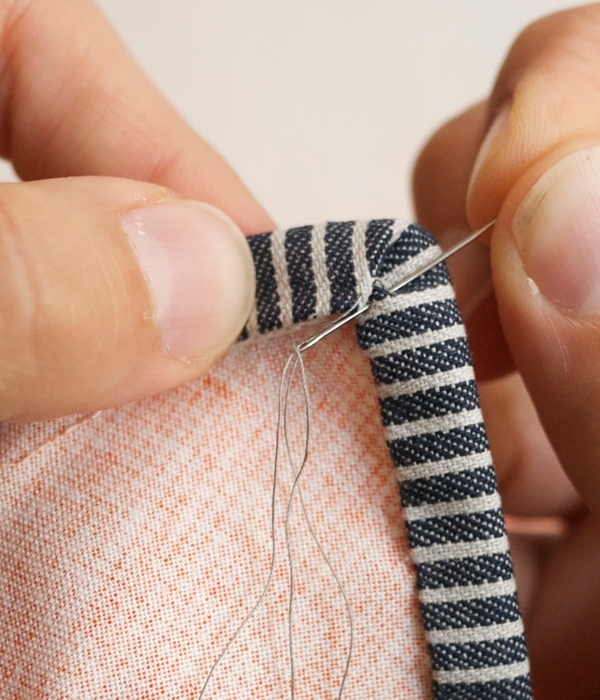 I have one question- why do you need two different types of thread? Can you use the same one for the machine and hand sewing? I’m not an advanced sewer so I was just curious the reason. Thanks! Thanks for getting in touch! 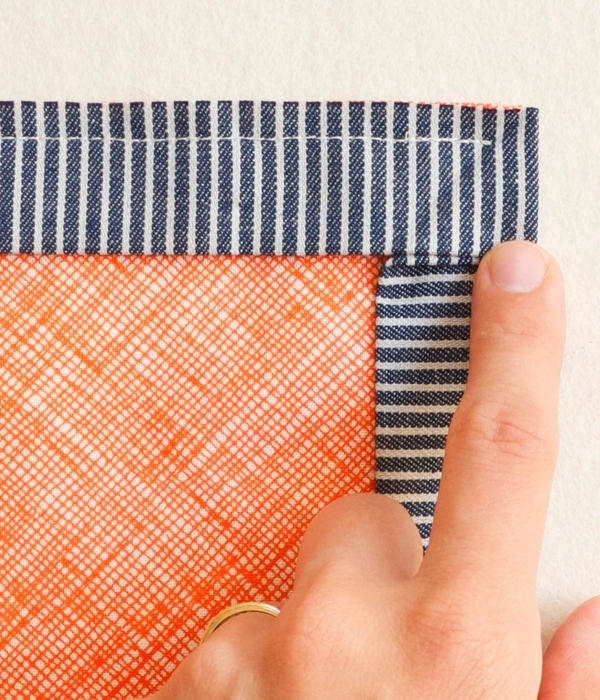 The Hand Quilting thread we used for the hand sewing is a little smoother feeling and doesn’t tangle as much as regular thread, but you can certainly make this project without it! This is lovely! 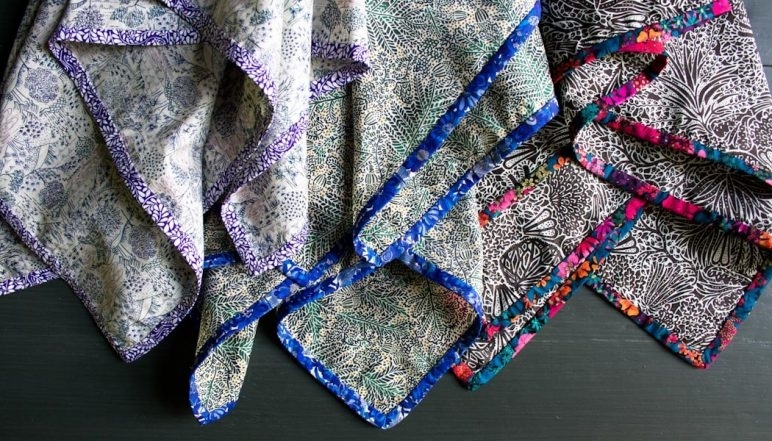 My favorite fabrics are Libertys! I am thinking it would make a great cowl. Has anyone done this? 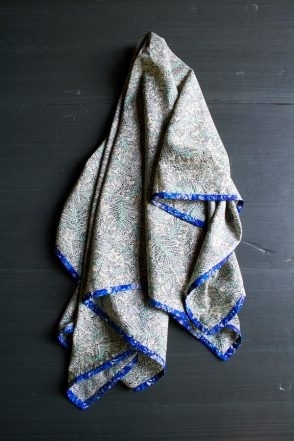 I believe I would wear it more in a narrower piece than a square scarf. I think I could just cut the length in two strips, maybe 8 in. 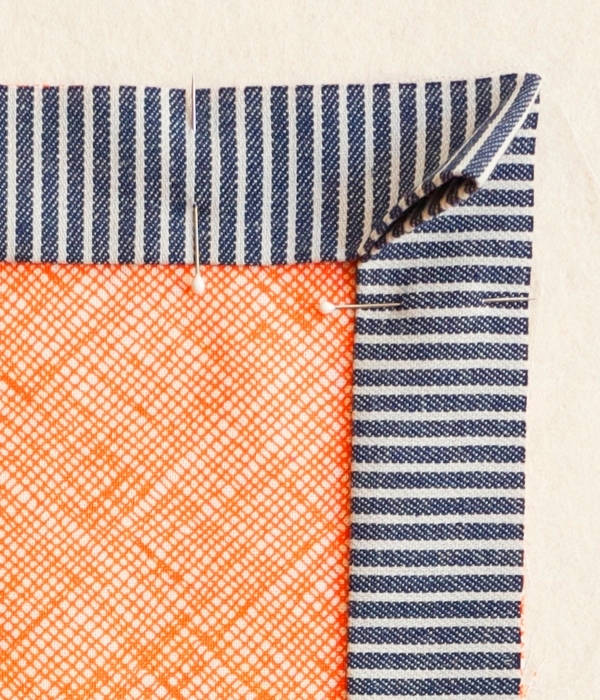 or so and seam together, then bind both edges. Or, maybe use a longer piece of yardage to avoid having two seams. What would be a good length for a cowl ? What do you think? Thank you for your kind words. 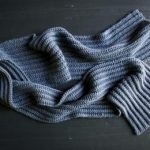 A cowl is a wonderful idea! Looking at some other cowls we have patterns for is looks like a 53″ circumference would be good. You can always go shorter or longer depending on if you want it to wrap around your neck more than once.